LATIN~ Cratagaegus oxyacanthus (english hawthorn). USE~ Commonly known as a heart tonic and treatment for heart disease, hawthorn also strengthens metabolism and circulation. It can relieve many problems such as sleeplessness, exhaustion, palpitations, anxiety and emotional heartache. It strengthens heart muscle and regulates heartbeat. Benefits the musculoskeletal system and reduces fluid build-up. CONTRAINDICATIONS~ Hawthorn is contraindicated with many types of medication. Hawthorn may increase the effects of digoxin, used for heart arrhythmia, beta blockers and calcium channel blockers, used to dilate blood vessels and reduce blood pressure; and central nervous system depressants. Hawthorn has blood-thinning properties, so do not use hawthorn if you are taking an anticoagulant. Its time to harvest Hawthorn berries! and also the time of year when we start preparing our bodies for fall and winter. Time to nourish ourselves and go within to heal our emotional bodies. The days are getting shorter and its time to put our energy into our roots just as the plants are beginning to do. Its self care time! What better way to heal and care for ourselves than to start with the heart! 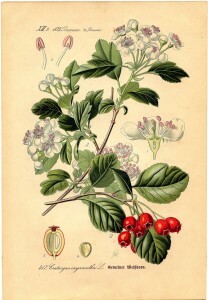 Hawthorn is very healing toward the emotional and physical heart. However, as the title to this post suggests, I’m not talking about the heart in our chests, Im talking about the heart in our wombs. As a flower essence, Hawthorn helps open the heart to giving and receiving love, and can help in healing heartbreak. It encourages self-love and self-acceptance. As with many heart-centered flower essences, hawthorn helps us to develop courage. The very etymology of the word courage draws our attention to the heart: cor is latin for heart! And courage is definitely an open-hearted state. As women our wombs are a highly energetic space. It is our creative heart and our power center. 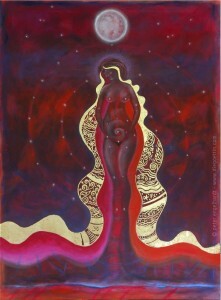 The uterus is the second chakra Svasithana “Her sacred above”. The second chakra is about creativity, sexual energy, connection to the earth and tides and control over our lives. When we create space and presence to honor our wombs, we embrace our own unique femininity and we can tap into our intuition, joy, creative intelligence and love for ourselves and each other. Hawthorn is beneficial not only to our energetic heart (in our chests and wombs) but physically as well. Hawthorn Improves digestion, eliminates waste, lowers blood lipids, and dilates blood vessels to promote blood circulation, which makes it an ideal remedy for menstrual pains and cramps. Women tend to internalize stress in the uterus – when we enter the paramentstrum (premenstrual phase and menstruation), our hormone levels decrease to release the uterine lining, our immune system becomes more compromised, and therefore we become more fatigued. When we do not honor our bodies during moontime, and keep moving forward at the same pace as when our hormones were rising post-menstruation, the body constricts, forcing itself to keep the pace – and that internalization of stress can cause period pain. A simple tea of hawthorn with ginger and raspberry leaf is quite effective in breaking up blood clots, promoting a smooth flow,toning the uterus and relieving cramps. It can help heal the emotional heart and supports you in achieving the dual purposes of menstruation – to release the old blood completely so the new blood can be regenerated. Fill a jar with fresh hawthorn berries or flowers. cover with honey. In 4 weeks or longer strain the honey. Childs Pose ~ Kneel on the floor – lean over your thighs and stretch your fore arms over your head and place your forehead on the floor. Gently arch your back and hold the position for a few minutes and repeat. This simple exercise allows gravity to pull the uterus back into place. The uterus is not attached to any other organ in the body, and often times can fall back against the colon. When the uterus contracts against the colon or the bladder, discomfort and period pain can result.